Jaipur: With Rajasthan unit BJP remaining headless head less for close to two months, chief minister VasundharaRaje has emerged as party’s face having shifted into campaign mode months before state goes to polls this year end. Raje, seemingly spurred by bypoll defeats, has visited more than 50 assembly constituencies across 16 districts in last four months to conduct Jan Samvad (public interaction). More such meetings are planned in the coming days. Besides, Raje has also been taking feedback from the party workers and meeting intellectuals and religious heads. She has also been announcing development projects during her visits that last two to three days. On some occasions, she has also ordered action against government officials for negligence or corruption on receiving specific complaints during Jan Samvad. After BJP lost the bypolls to two LokSabha and one assembly constituencies earlier this year, there was talk of a cabinet reshuffle and a major overhaul in the state organisation. Raje had then planned to launch a ‘VikasYatra’ from tribal-dominated Udaipur to cover all the 200 constituencies, but subsequently it was cancelled. Instead, Raje has been shuttling between Jaipur, where she chairs government and party meetings, and different constituencies. So far, she has covered three to four constituencies each in Sikar, Jhunjunu, Sriganganagar, Pali, Chittorgarh, Jhalawar, Kota, Banswada, SawaiMadhopur, Nagaur, Karauli, Dholpur, Jodhpur, Kota, Udaipur, and Ajmer districts. 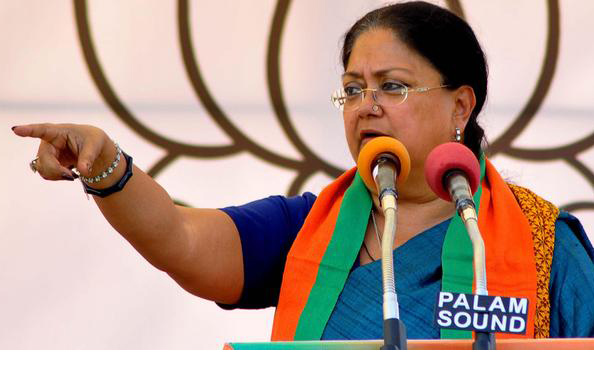 “In the coming days, she will be visiting more districts and the aim is to cover nearly all the 200 constituencies before the model code of conduct comes into effect,” a BJP leader close to Raje said. Assembly elections are likely to be held in November or December.Raje followed up a populist budget she presented in February with further concessions to different sections of the society during her reply to the Appropriation Bill in March. Since then, she has met party officebearers from different districts to understand the impact of the announcement and take feedback on the government functioning.Raje’s public meetings are evoking good response as apart from announcing development works, she is also distributing freebies. During her last Jan Samvad in SawaiMadhopur on Wednesday, she announced development works worth Rs 147 crore. She also announced to increase the minimum wage rates for labourers.The CM also met the beneficiaries of different welfare schemes and distributed laptops and two-wheelers among the meritorious students. A section of beneficiaries met Raje in person and she took feedback about health insurance scheme. Raje also met the girls who were the beneficiaries of Rajshri scheme. Under this scheme, parents of girl child get paid a fixed amount in installments, right from the time when the girl child is born to when she clears class 12.In 2013 Assembly elections, the BJP secured a landslide victory winning 163 out of 200 seats while its vote share climbed to 46.03% from 34.27% in the previous assembly polls.The vote share of Congress fell by 3.14% to 34%, which translated into a decrease of 75 seats with party managing to win only.